Learn more about Coldwell Banker's Ultimate Service program. Learn more about Coldwell Banker, one of the oldest and most established real estate brands in North America. Your ultimate resource for all that is happening in the Fort McMurray Real Estate market. Either you are a first time home buyer or looking to buy or sell your Fort McMurray home visit our blog. Whether you are buying your first home, or your fifth, the process of buying a home is a detailed, time-consuming venture. At the same time, it is an emotional period laden with difficult choices. Whether you are buying your first home, or have been making mortgage payments for years, you may be thinking about reducing this obligation, faster. Get started buying residential property in Fort McMurray. Six tips to get you started on the right track buying a new Fort McMurray home with help from The Lore Group. Contact The Lore Group at 780-370-3325 to get more information on how we can help you buy or sell Fort McMurray real estate. In partnership with Royal LePage True North Realty. First time home buyers in Fort McMurray can streamline the buying process by getting pre-approved for a mortgage before starting their house hunt. Learn more about the mortgage approval process. Susan Lore is an award winning Coldwell Banker Fort McMurray real estate agent who focuses on client satisfaction. She is one of the most knowledgeable Fort McMurray Realtors. Jamie Hewat has been a trusted and respected Fort McMurray real estate agent since 2003. She has extensive experience with home buyers, sellers and investors. The Lore Group's in house Client Care Manager is here to ensure your Fort McMurray real estate experience is excellent from start to finish in every detail. Relocating to Fort McMurray? The Lore Group specializes in Fort McMurray real estate from residential Fort McMurray homes to commercial and industrial oilsands property and development. Thinking about or planning to move to Fort McMurray? The Lore Group has all the information you need to get started. The Fort McMurray Real Estate Agents of The Lore Group are experts in Fort McMurray residential, commercial and industrial real estate. Tristan is working as real estate agent at The Lore Group and has the edge that clients need when negotiating and a firm commitment to client satisfaction. All materials on this website including databases, source codes, forms, stock default content, templates and engine, but excluding custom design elements and client-inputted content management system. Use our Community Property Search tool to quickly and effortlessly browse Fort McMurray communities and neighborhoods for homes for sale. Access all Fort McMurray property listings. Setting the right price for your home is the most important first step in getting you home sold fast and for the most money. Let The Lore Group help with a free Fort McMurray Home Evaluation. Thinking about selling your Fort McMurray home yourself? Learn more about the For Sale By Owner process to see if the hands-on selling approach is really for you. Get instant access to the hottest local featured listings, including newest listings and exclusive offers from The Lore Group. The Lore Group specializes in Fort McMurray real estate from residential homes to commercial and industrial oilsands property and development. Are you thinking about investing in Fort McMurray residential, commercial or industrial real estate? Contact The Lore Group for more information about investing in Alberta oilsands property. Browse all of The Lore Group 's personal Fort McMurray listings and featured office listings and see the best homes for sale in the Fort McMurray market today. Read testimonials from some of our past and current clients and learn more about The Lore Group's high standards of client service in every facet of Fort McMurray real estate. Search all Fort McMurray and surrounding area real estate MLS listings and Fort McMurray MLS using our comprehensive property search tool, integrated with Google Maps. Search all Fort McMurray and surrounding area real estate listings and Fort McMurray MLS using our comprehensive property search tool, integrated with Google Maps. The Lore Group's mortgage calculator lets you work out the mortgage payment plan that is right for you. Modify the numbers below to recalculate your estimate. 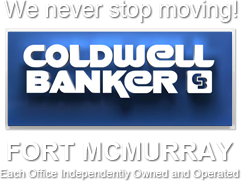 Do you have a friend or family member interested in buying or selling Fort McMurray real estate? Refer them to The Lore Group to guarantee they receive outstanding service. Is your client relocating to Fort McMurray? The Lore Group specializes in relocations to the Alberta Oilsands region: refer your client to guarantee they receive outstanding serivice. Have expert prepared reports on buying and selling Fort McMurray real estate delivered for free right to your email inbox, including great tips, market information, and investing info. The Internet has changed how buyers and sellers approach the Fort McMurray real estate market, and to ensure you have the best opportunity of selling your Fort McMurray home. Why register for an account with the Lore Group - Fort McMurray Real Estate specialists. The Lore Group is a top Fort McMurray real estate agent, and can help you buy or sell Fort McMurray successfully. Learn more about The Lore Group 's service. Get new listing updates daily in your email inbox by entering your home preferences and prices into the form, and The Lore Group will take care of the rest. Get more information about buying Fort McMurray residential real estate, from house hunting and arranging a mortgage to making an offer and organizing your move. Almost everybody requires a mortgage to purchase a Fort McMurray home, but if this is your first mortgage you probably have a lot of questions. Learn more about mortgages here. The day has finally arrived, and it's time to close the deal and take possession of your new Fort McMurray home. Learn what to expect and who gets involved in closing day so you're prepared. Before you start searching for a Fort McMurray home for sale, you should first consider your present and future lifestyle to ensure you are looking for the home that will best match your needs. It's important to sit down before you start your Fort McMurray house hunt and make a list of the things you need in a new home and the difference between what you want and what you really need. When it's time to begin searching for a Fort McMurray home, there are some tips that will help you keep focused and make the best decision for you and your family. Shopping for a new Fort McMurray can be an emotional experience, and is always a time consuming process. It's important not to get too caught up in the excitement and forget the details. In the excitement of searching for your first Fort McMurray home, it's important not to forget to spend the same time searching for a mortgage. Before you begin searching for your Fort McMurray home, begin by considering your lifestyle, what you need from a home, and how much you can reasonably afford. Investing in Fort McMurray real estate can be a great way to create long term investments that reliably grow, providing great opportunities. Sometimes a Fort McMurray home buyer will get excited and fall in love with a home for the wrong reasons. It's important to go into the home shopping experience carefully and thoughtfully. You've found the Fort McMurray home of your dreams and now it's time to make an offer to purchase. This section of our guide will help you understand the offer and negotiating process. When you're buying a Fort McMurray home, you want to know you're getting the best possible price. How do you know what the best price is for a particular home in today's market? When you're buying a home, there is an entire team of Fort McMurray real estate professionals ready to assist you, including real estate agents, lawyers, insurance agents and mortgage specialists. Get more information about selling Fort McMurray residential real estate, from marketing and showing your home to screening offers and the final closing process in our Sellers Guide. When your Fort McMurray home has finally sold, it's time to go through the checklist of closing tasks, including adjustments, net proceeds, closing costs and possession dates. It's always a good idea to improve the exterior appearance of your house when you put your Fort McMurray home on the real estate market. When you are selling your Fort McMurray home and planning a move, things can get stressful quickly. Take the time to do things right and respect that moving can be an emotional process. If you've tried everything to sell your Fort McMurray home and are still waiting for the right buyer, take a look at your listing and see if any of the following five reasons could be why. When you are moving to your second or third home, the real estate process can be more complicated because you may be both buying and selling a Fort McMurray home at the same time. Almost every single Fort McMurray home buyer will want to have your home for sale inspected before finalizing their offer to purchase. Once your Fort McMurray home for sale is listed, prospective buyers will likely start popping up and want to view your home. Here are some tips for keep your home in showing form. When selling a Fort McMurray home the little things can go a long way to increasing the price you will receive and how quickly your home will sell. Here are some low cost tips. Get valuable information on selling your Fort McMurray home and getting it ready to market and show, including making repairs, low cost improvements with big impact, and staging. When you're showing your Fort McMurray home for sale, creating the right atmosphere in your home isn't just about having things look good. You've decided you want to sell your home yourself rather than hire a Fort McMurray real estate agent. We've provided a list of things that will need to be completed for a successful sale. When you're selling your Fort McMurray home, the price you set is a critical factor in how much you sell for and how fast you sell. This section of our Fort McMurray home sellers guide provides you with information about the factors that will affect your decision to sell your Fort McMurray home. When you are buying or selling a Fort McMurray home, your most important concern will be getting the best price, but how do you know what fair market value for your home. Whether you're downsizing, upgrading, relocating or buying a home for the first time, before you decide to jump into the Fort McMurray real estate market it's a good idea to consider timing. Choosing to buy or sell a Fort McMurray home is probably one of the biggest financial decisions you will make and it's important to make sure you've chosen the correct agent. A qualified Fort McMurray real estate professional will be your most valuable resource throughout the process of selling your Fort McMurray home, and can advise you on the best price. When it comes to the sale of your Fort McMurray home, a professional Fort McMurray real estate agent on your side will help protect your long term investment. Selling your Fort McMurray home yourself may seem like a simple matter, but the truth is selling a home is a much more complicated process than most people think. Before you put your Fort McMurray home on the market, you should make sure you understand all of the costs involved in selling a home, including closing costs, legal fees and assessments. Before you put your Fort McMurray home on the market, it's a good idea to make sure you have all your paperwork and documents in place to ensure the selling process goes as smoothly as possible. From choosing the right Fort McMurray real estate professional to understanding the current market conditions and having all your paperwork ready, get ready to sell your home. Setting the right price on your Fort McMurray home for sale is one of the most important steps in ensuring your home sells. There are many factors to consider. A qualified and professional Fort McMurray real estate lawyer is an essential part of any home seller's strategy. The sale of your home is a precise legal procedure that requires expert attention. Numerous factors affect the Fort McMurray real estate market, and it's important to make sure the status of the current market and how it will affect your bottom line. When an offer to buy is presented by a prospective Fort McMurray home buyer, the next step is to sit down with your Fort McMurray real estate professional and evaluate this offer carefully.